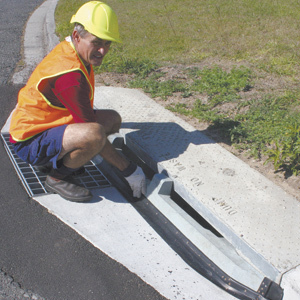 The Catch-it is a robust storm water drain pollution protection system. Made from solid durable recycled plastic and rubber components, it can be moved from site to site. It is designed for road-side or side entry drains and reduces the amount of sediment or solid pollution entering the drain from the side. The Catch-it comes with a two year pro-rata warranty. • Construction sites or earthworks near established side entry drain systems. • Designed for standard drain dimensions in Qld and NSW. Drain entry must be 100mm high and 1900mm wide to fit.